Condition: Fairly good. Fold as issued. Ample margins. Soiled in margins outside image. Few small tears on central fold. Verso: Latin text. 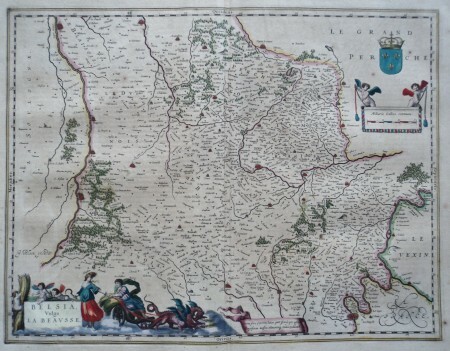 Large folio map oriented to the west of the region of Chartres, Orleans and Blois. Paris at bottom right. The cartouche depicts Ceres in a dragon-powered chariot and other agricultural imagery suggestive of the region's produce. A distance scale held aloft by two cherubs, and a ribbon-style banner with notes.